There are so many Panama City Beach restaurants that it can be overwhelming. If you are looking for places to eat in Panama City Beach this is the list for you! Warning though, you are going to get hungry as you read thru this list of Panama City Beach restaurants, everything we ate on our whole trip was absolutely amazing! One big thing I noticed while in Panama City Beach Florida is that fresh is a keyword with all of the Panama City Beach restaurants. The restaurants all pride themselves on having fresh and flavorful food, and no where that we ate disappointed us at all! This may have been the best place for foodies that we have ever gone to visit! I am going to warm you ahead of time, that reading this post about the Panama City Beach restaurants might make you a bit hungry. 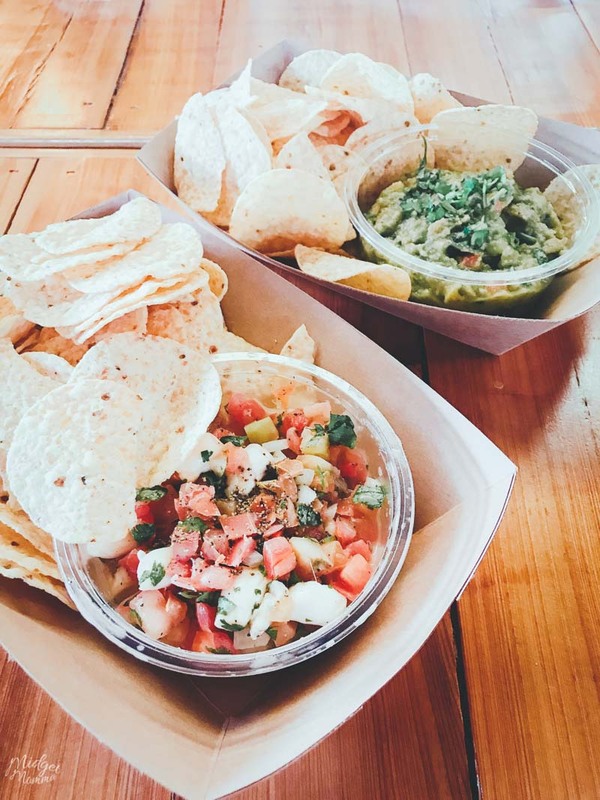 While writing this post, I got really hungry thinking about all of the amazing food we enjoyed when we were in Panama City Beach Florida! 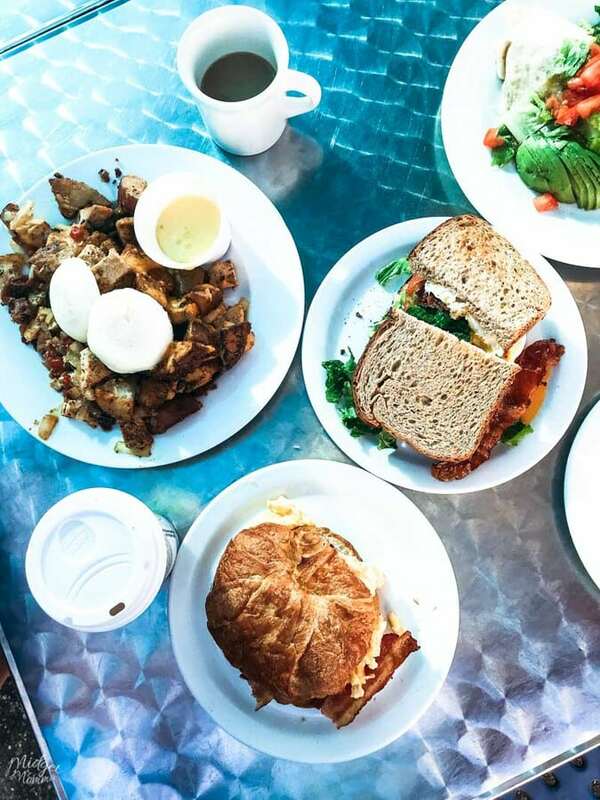 At Andy’s Flour Power, you can grab breakfast, brunch or lunch! Stop in Monday thru Friday from 7am-2pm, Saturdays 7am-1pm and Sundays 8am-1pm. At Andy’s Flour Power they boast about taking pride in using on the best fresh ingredients to make the best homemade meals. I can’t argue that! Everything we tasted from the menu was amazing! 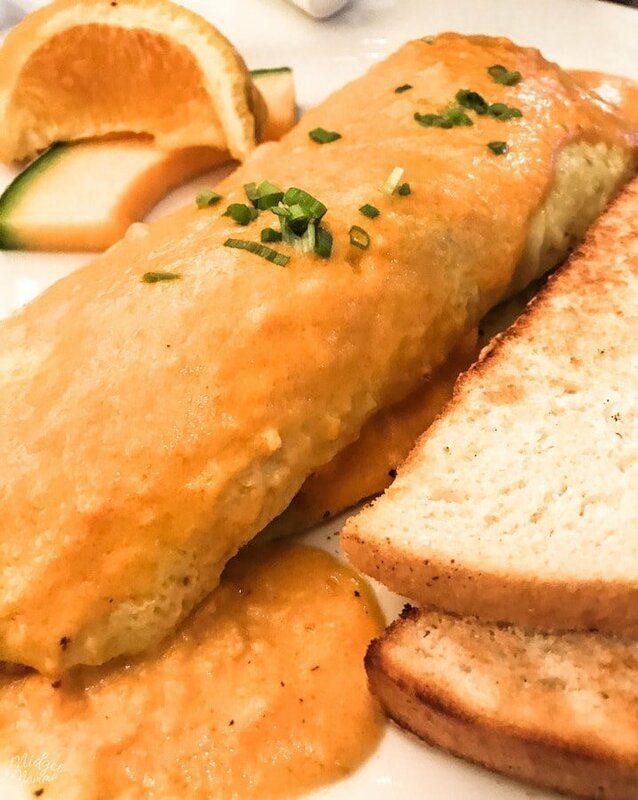 We were there during the weekend brunch menu, that has some different options then the regular menu, but you can also get the regular menu items as well. I had the Surf and Turf omelet and OMGOSH! It was soooo good! Bacon, caramelized onions, mushrooms, smoked gouda cheese topped with lobster bisque! YES! It was as amazing as it sounds, with every single bite I took! 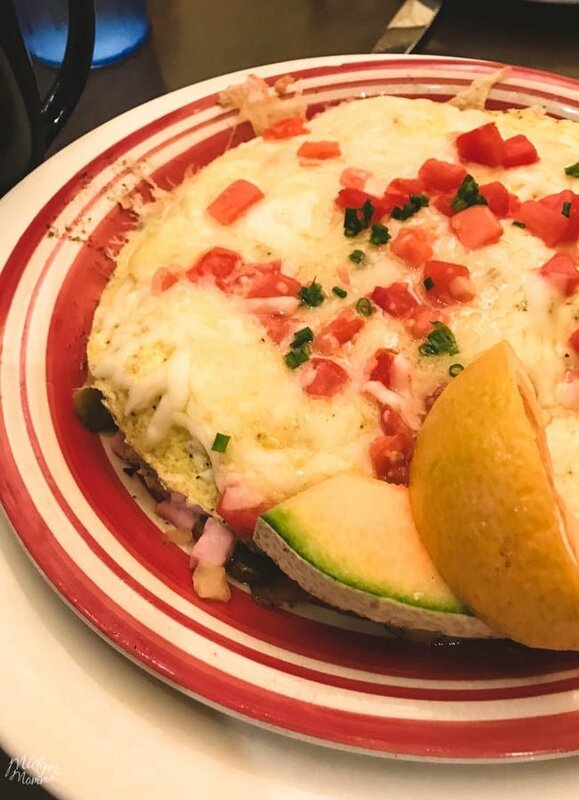 McKenzie enjoyed the Cafe Skillet, made with seared potatoes, onions, peppers, then a layer of eggs, ham and finally a layer with melted cheddar cheese and tomatoes! 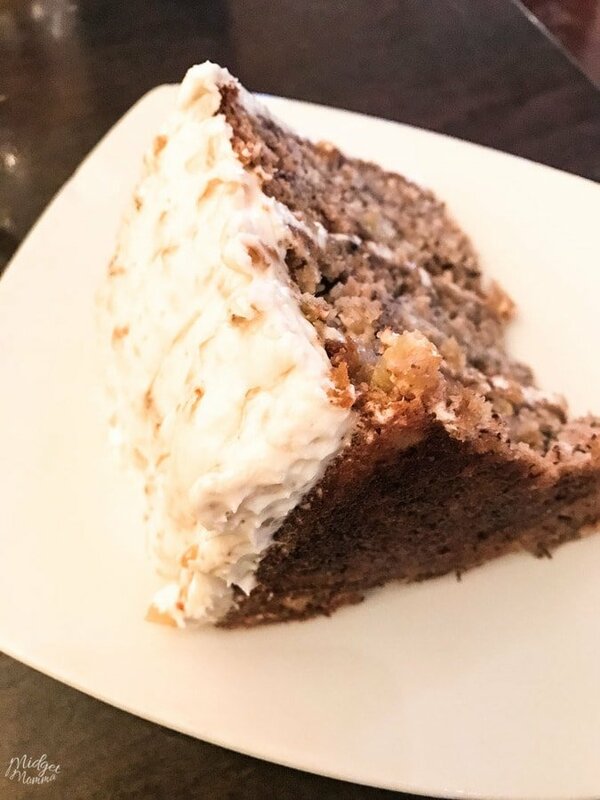 If you are thinking that you need an extra special treat, even if it is breakfast time, get a piece of the Hummingbird Cake! Sooooo GOOD! And yes it is totally acceptable to enjoy it for breakfast! 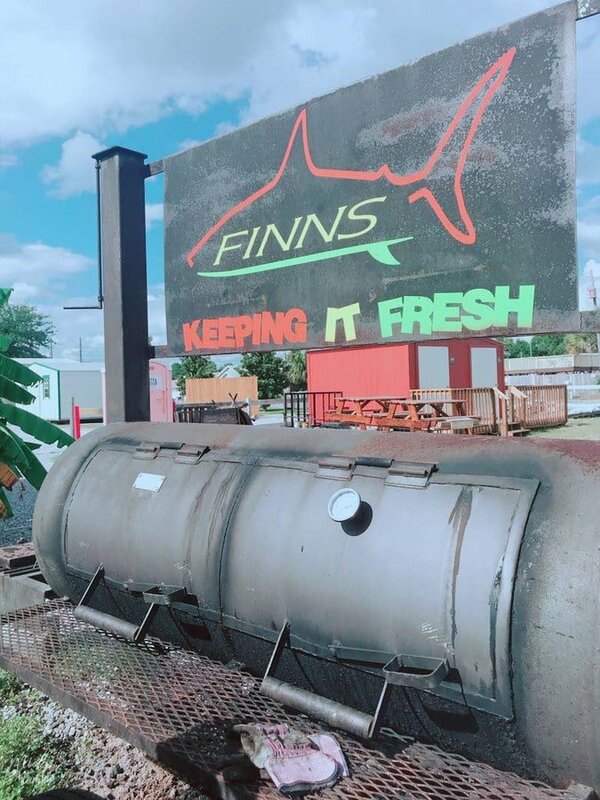 This little spot brings big flavors to your meal with their well known Finn’s Original Fish Tacos as well as other tasty dishes including, burritos, nachos, ceviche, quesadillas, and more! They are open from Tuesday to Sunday and serving breakfast from 7am to 11am, lunch from 10am to 3pm and dinner on Thursdays, Fridays, and Saturdays from 5pm-8pm. By accident I walked around to the back of the restaurant and found a HUGE smoker in the back, and someone who worked there who told me all about how they cook the food. I wish I had gotten his name, as he was totally awesome and answered any question I had and he totally didn’t even think I was crazy. Well if he did think I was a bit crazy for asking all those questions, he didn’t lead on to that at all! I learned they cook the fresh meats (tuna, chicken and pork) right in this smoker for HOURS to give it the most amazing and delicious flavors! The pork takes 18 hours in the smokers, tuna takes 12 hours in the smoker, and the chicken takes 6 hours in the smoker! Now that is some dedication to cooking amazing food! I also learned that fresh and flavor are the most important things to them for all the food they cook and serve. You can totally taste the freshness when you take a bite. The menu shocked me at just how many different items were on it for such a small place. I totally did not expect that when we first pulled up. For our meal, we enjoyed fresh made ceviche and homemade guacamole to get started. Then came our meals. 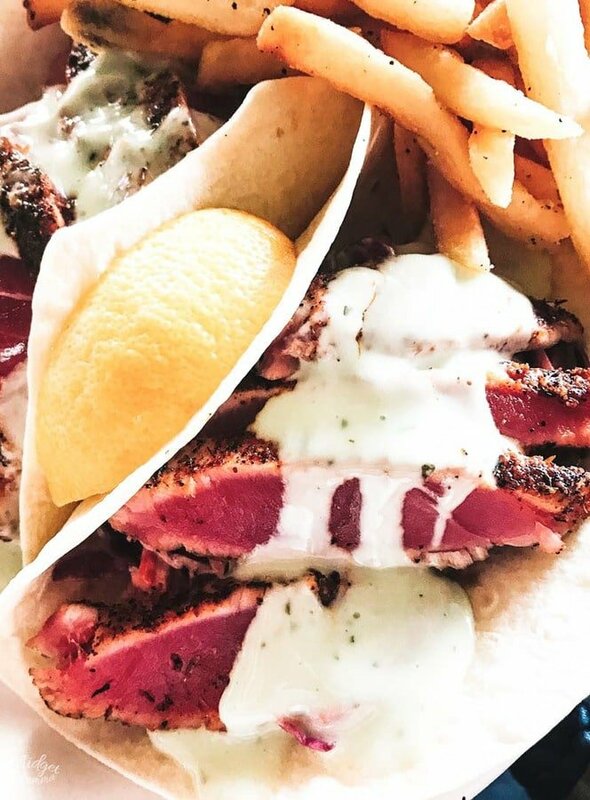 I had the Ahi Tuna Tacos, and I can not remember what McKenzie had other then I took a bite of it and it was amazing just like mine was! 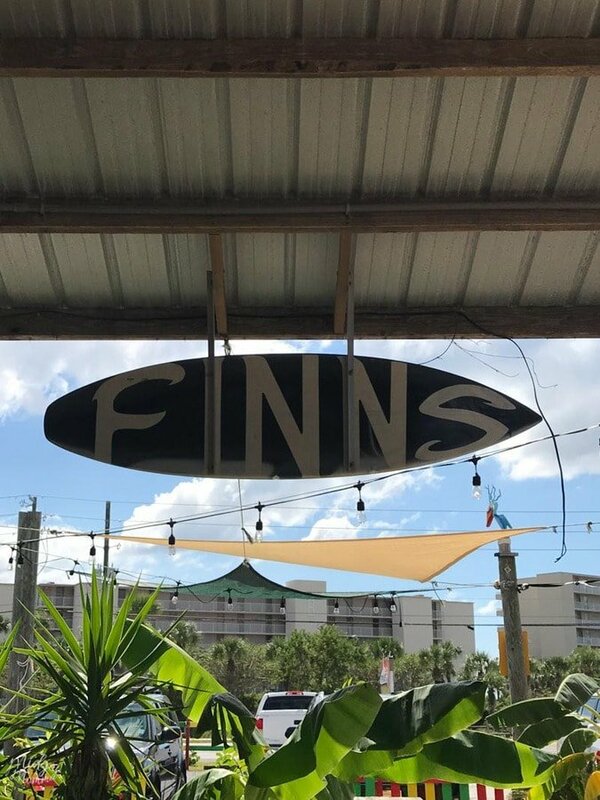 Right next to Finn’s Island Style Grub you will find FINNS Barista Bar and Snack Shack, that is the perfect place to grab a coffee or any other tasty beverage along with a variety of snacks. One thing that was totally amazing here was that they let McKenzie get creative and her creation turned out amazing! 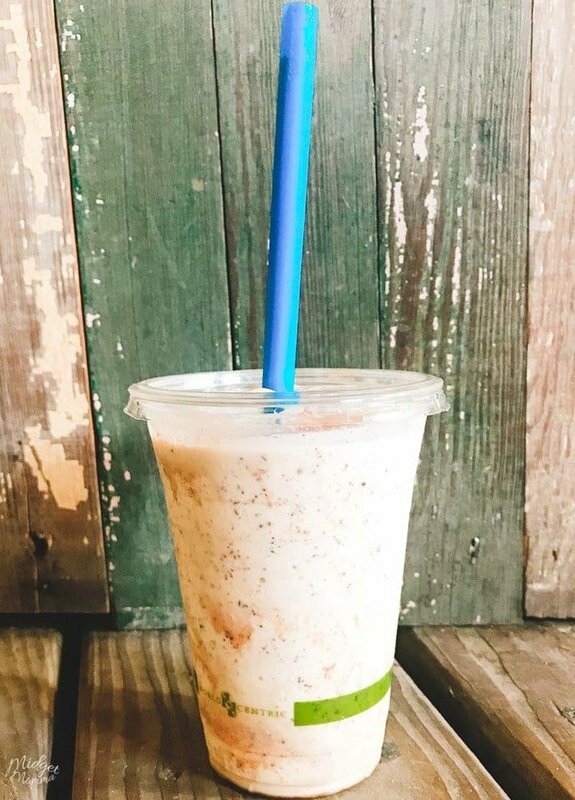 They have what is called the “Coffee Milkshake”, that is made with coffee, homemade flavor syrup and ice cream. McKenzie asked if she could have them try to make it with the pumpkin seed and they did it. Oh my goodness, it was seriously one of the best drinks I have ever tried! I was actually quite jealous I hadn’t thought of it myself! If you are looking for quick but tasty then you want to make a stop at Liza’s Kitchen. Ordering food here is super simple, you order at the counter and then they bring it out to you. You get to enjoy the outdoor while having an amazing breakfast! 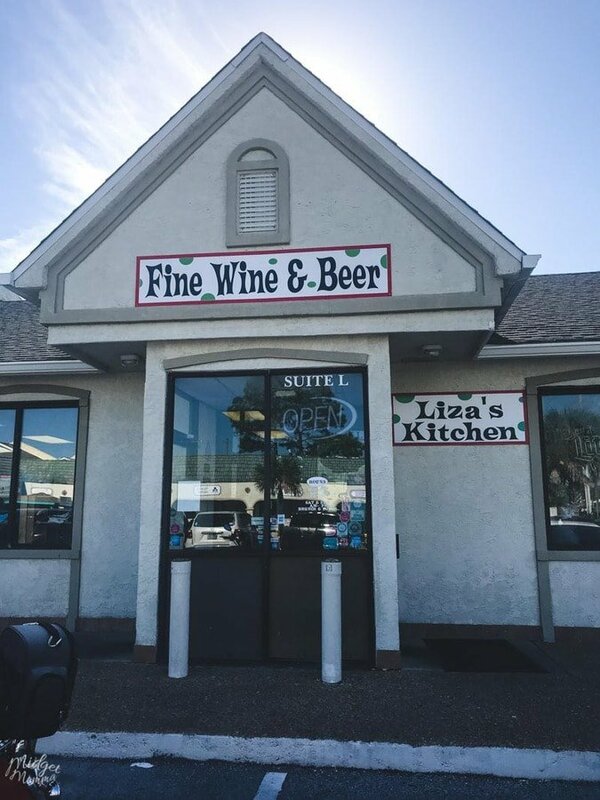 Liza’s kitchen is open from 11am-4pm Monday thru Friday and 9am-3pm Saturday and Sunday. The menu items consist of much more then you would expect for a tiny place. What I found amazing about this place was for as tiny as it was, they make everything from scratch! I mean everything, from the Focaccia bread, the soups, the salad dressings and everything else! We were there during weekend brunch hours and enjoyed the brunch. I was in the mood for simple, so I went with the bacon, egg and cheese croissant. One thing I love about croissants is the flakiness, yes it can get a bit messy but I am totally ok with that. However many times when I get a croissant sandwich, it is no flaky and kinda soggy. The croissant sandwich at Liza’s Kitchen was PERFECT! 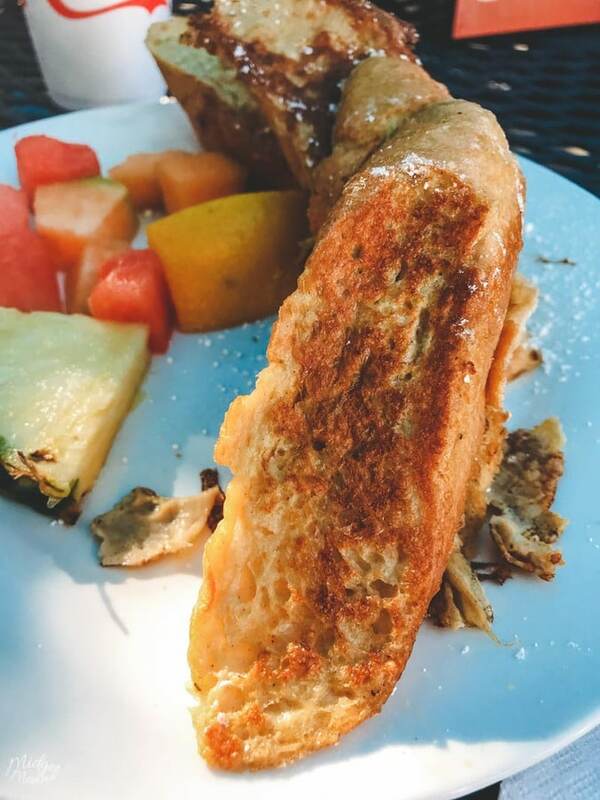 McKenzie opted for the french toast, that is made with fresh baguette, and served with fresh fruit! It looked amazing, she said it tasted just as good as it looked! If you are going there for lunch, they always will have Tomato-Basil Soup AND a soup of the day (sometimes 2 soups of the day!). Plus after taking a peek at the lunch menu, it sounds just as amazing as what we had for breakfast, including a Turkey Brie sandwich that is making me hungry just thinking about it! 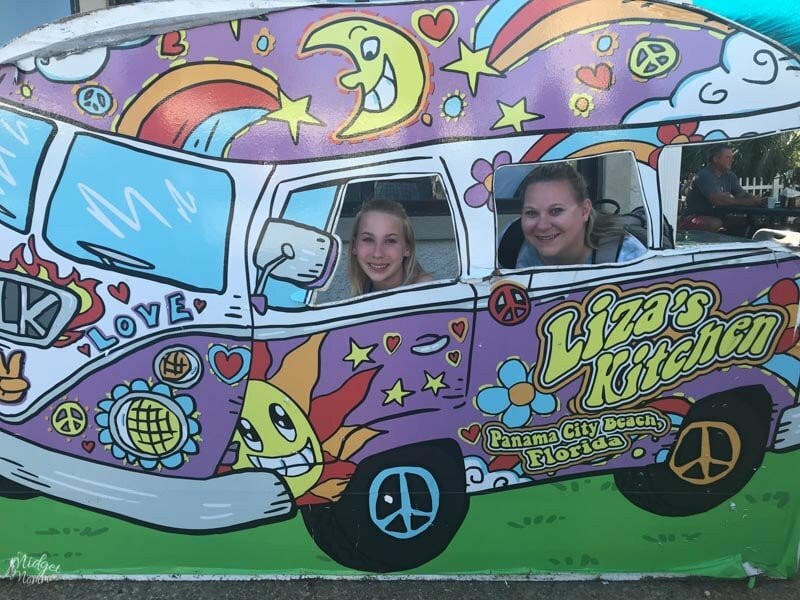 Plus on your way out after eating at Liza’s Kitchen, don’t miss the awesome photo opp where you can take a photo in the Liza’s Kitchen car! We LOVE seafood! Seriously McKenzie and I can totally eat it daily and never get sick of it. 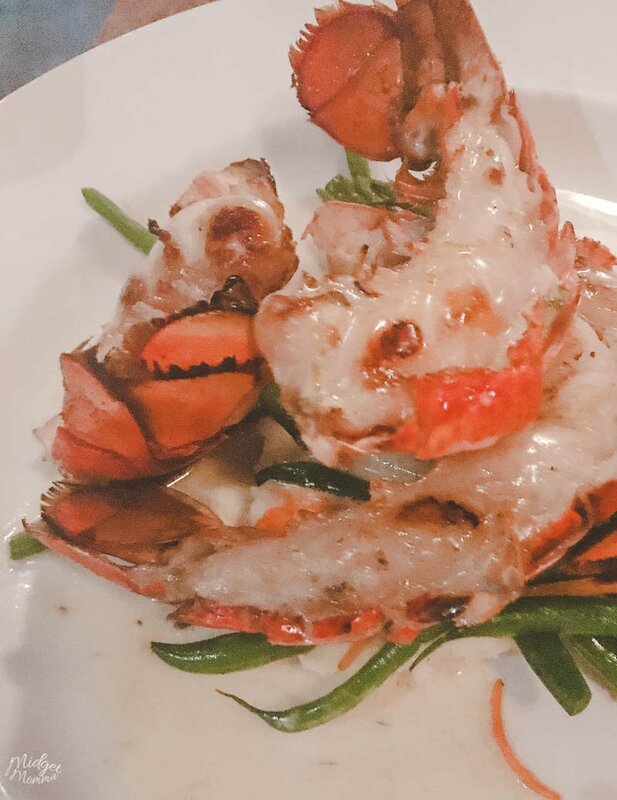 (Which I am sure you are noticing as you read this post about the Panama City Beach restaurants, that many times she and I picked a seafood dish.). 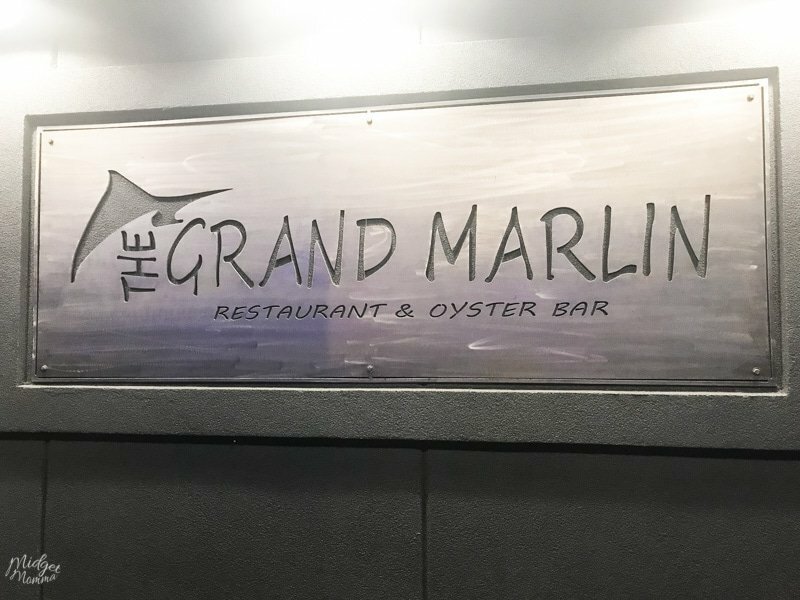 The Grand Marlin is the place to go if you are wanting amazing seafood! I am going to warm you that the photos are not the best, the restaurant is beautiful but the lighting for taking food photos is not all that great. I wish I had gotten photos of the restaurant itself, but I was a bit focused on the amazing food that we were enjoying. Finding AMAZING seafood (we find GOOD fairly easily) is something that always tends to be the hardest when we are traveling. Growing up on eating fresh out of the water, Jersey shore crab, bluefish, snapper and more I am rather spoiled when it comes to seafood. I am also rather picky about my seafood as well. I can tell if what I am eating is fresh or if it has been frozen before being cooked. The Grand Marlin had so many amazing sounding choices, that picking what we wanted to eat was slightly difficult. Although in the end, even though we were both sitting at different ends of the table, not next to each other we both ended up picking the same thing! 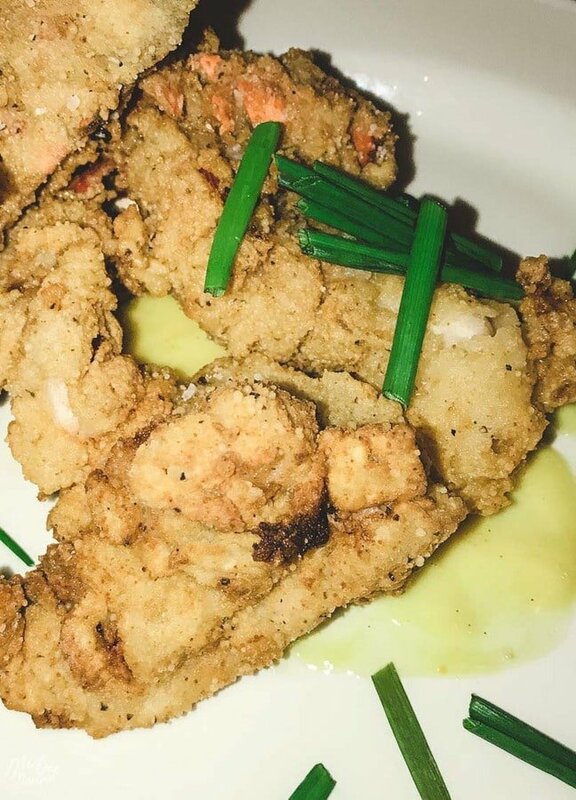 Crispy Lobster Fingers with Vanilla bean infused honey mustard sauce as the appetizer and the Key Lime Grilled Lobster Tail! I also had amazing friends that we were with who let me take photos of their meals and bites of their meals as well. EVERYTHING was amazing! There was nothing that we tried that was not ABSOLUTELY AMAZING! And yes that is coming from me, the picky seafood eater! 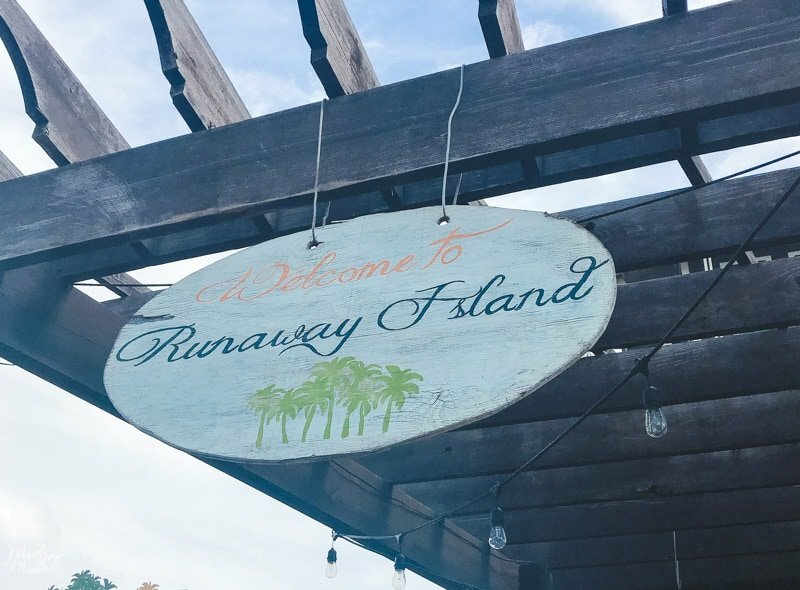 If you are looking for AMAZING seafood, but a relaxed beach zone atmosphere then Runaway Island is the place to go and grab a bite to eat! I will warn you with this one, that everything on the menu sounds amazing and picking just one item is soooo HARD! When you are eating you can eat inside or you can eat outside, whichever you choose, but both options have a beautiful view of the beach and the ocean! I loved how relaxed we could be while eating food that was so amazing! McKenzie and I of course, headed for the seafood and it was delicious! 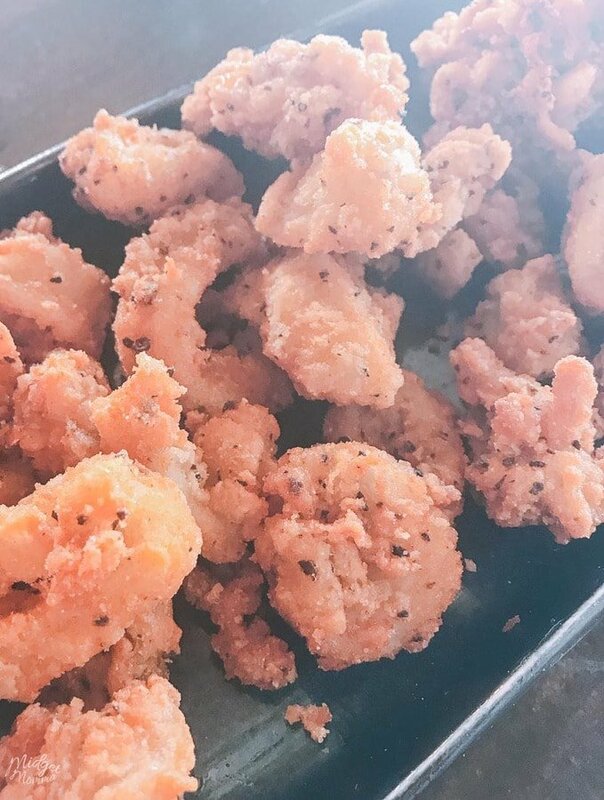 Calamari is one thing that we love, but many times when we go to a restaurant it is over cooked, over breaded and rubbery. The Calamari was lightly breaded, fried crispy and served with 2 sauces, Sweet Thai & Lemon Aioli and totally perfect! 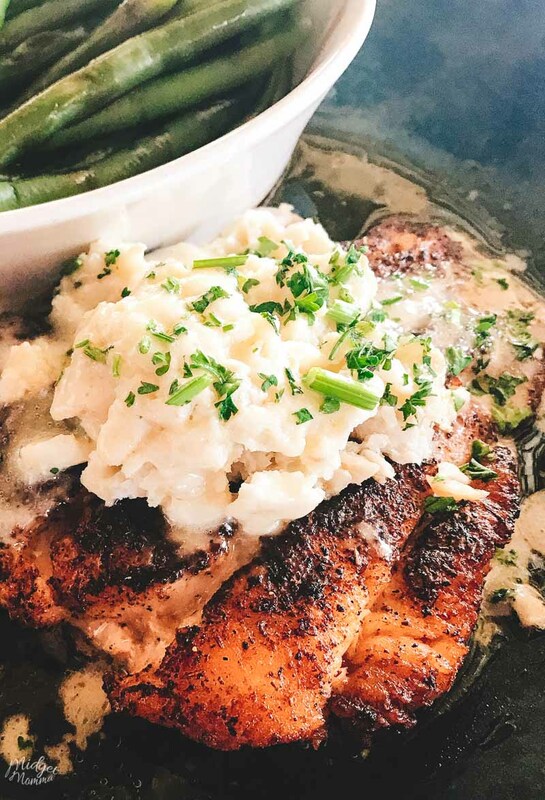 I will always pick a local seafood if I can, and went with the Runaway Grouper, a blackened Grouper topped with lump crab served with Lemon Butter sauce over the top. Oh it was delicious! Perfectly cooked, the crab meat was amazing! I would definitely order this next time too! McKenzie had the Islamorada Platter, a huge portion of the Catch of the Day fish, bay scallops and shrimp! It had the perfect amount of breading and fried just right according to McKenzie. Which of course I am rather bummed, because I totally failed here and can not find the photo of it, that I know I took. So just trust me on this, it is HUGE! Both of us had second contenders for our meals once we heard the waitress tell us about the fish tacos. 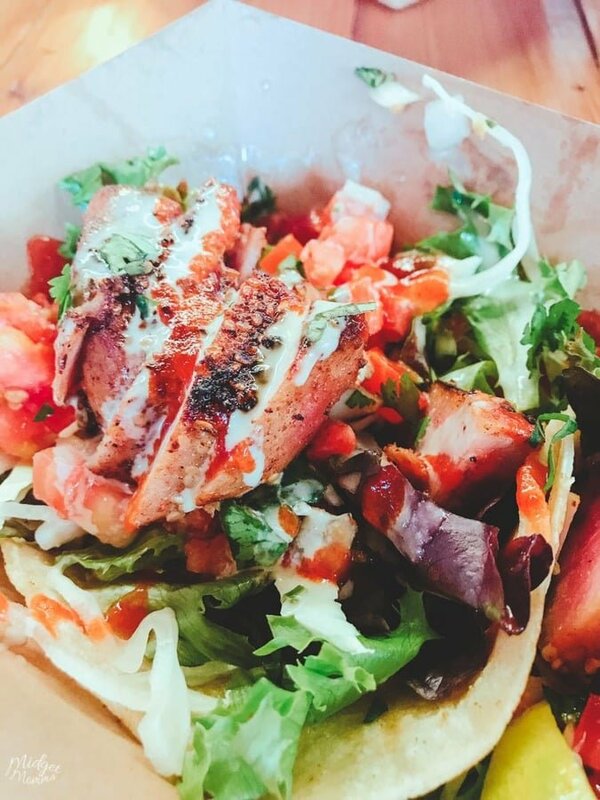 We couldn’t fully decide so we also got an order of the fish tacos to try! They were amazing! 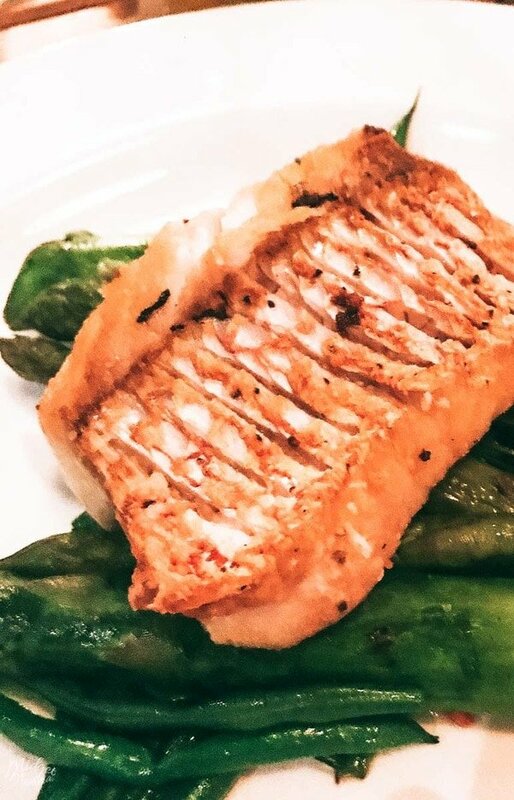 You could see the freshness of the fish just looking at it and the fresh taste was amazing! I know when you are traveling finding good, quality restaurants can be a struggle, so I hope that I didn’t make you all to hungry with this post. 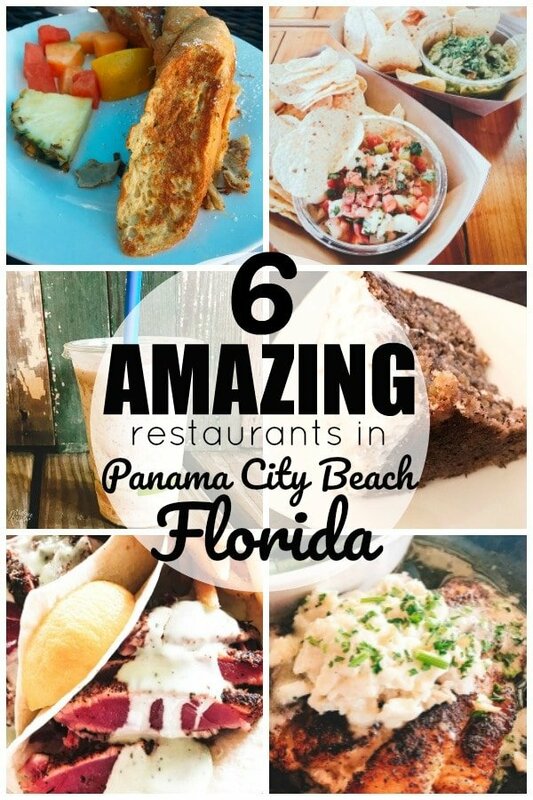 I hope that it helps all of you figure out which Panama City Beach restaurants to head to when you want to grab an amazing bite to eat! 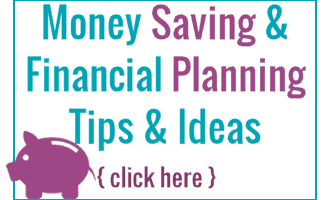 Be sure to also check out these other posts to help you with planning your trip to Panama City Beach Florida!